The yarns chosen for this cowl include wool, mohair and acrylic. The predominate color is blue. However, there are different shades of blue including a shiny light blue which gives the cowl a bright look. The white yarn has bits of purple in it and it blends in beautifully with the gray mohair and the other blues. The cowl measures 9" high which makes it perfect to either fold over or to cover your mouth when that mighty wind is blowing. It has a circumference of approximately 25" and has some give to stretch it out a bit while putting it over your head. Since this cowl is made with a combination of different yarns, I recommend washing it either by hand or in the machine in cold water. When washing in a machine, either use a gentle cycle or put it in a lingerie bag. Air dry. Stay warm with this cowl. 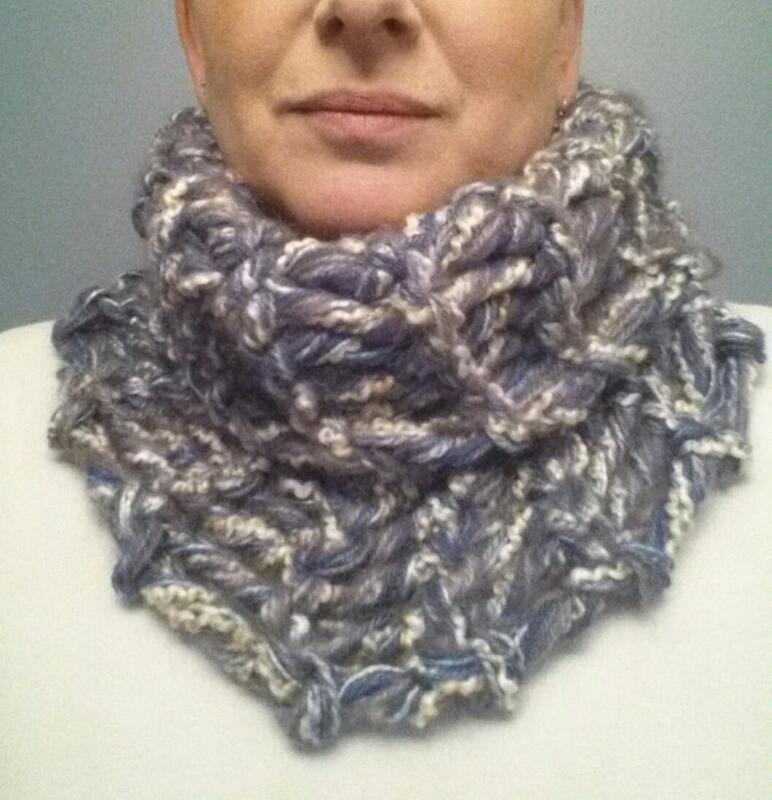 If you would like this cowl in a different color combinations, please contact me. I can usually grant your wish! I need 2-3 days to knit it and to ship. This cowl was HANDKNITTED by me! Not by any machine!